Use the menus to limit criteria. 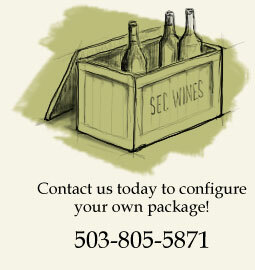 Sec Wines offers professional, experienced customer service that takes the hassle out of corporate gift giving. Whether you need to send one package, or one thousand, trust us to get the job done right while keeping you on budget. Corporate gift giving - We’ll aid in the selection of wine that reflects your good taste and keeps you within budget. Are you an Oregon company? Consider giving your clients Oregon wine. Wines selection and delivery for your next party/convention/fund-raiser. Wine education classes for your staff. delivery to your office on qualifying orders. Call or email us today to see how we can make your life easier.